I swung by Sephora on my way home from returning something at J.Crew yesterday. The proximity of these two stores to my apartment is bad for my savings plan. As I told you all during beauty week, I have been using Lancome's eyeshadow primer. I love it more than the Laura Mercier one I previously used, but recently it has dried up substanially and is difficult to apply to my eyes. There's still probably about 1/3 of the tub left, so I'm quite annoyed by this. I have been putting up with the dried globs that it takes to apply the product but am so sick of it. I considered a couple of different options but after rave reviews from the lady at sephora (and some backup research on my phone), I purchased Urban Decay's eyeshadow primer. The saleslady told me this is great and is one of their bestsellers, so hopefully it lives up to that. I'll let y'all know. I also bought Lancome's waterproof mascara. I've heard from many people that this is the best waterproof option out there. So hopefully too will live up to it's reputation, because ontop of friends' weddings and events for my own I have a few months of wrong-distance in my near future. I'll be truly putting this mascara to the test. Once again, I'll let you know what I decide! 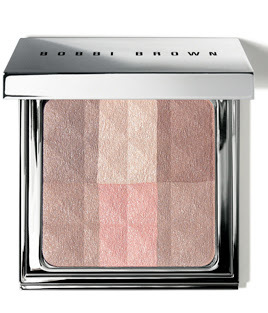 This BB brightening finishing powder is next on my wishlist in the beauty department. Less than blush but still illuminating, the online talk makes me want to go out and buy it today!